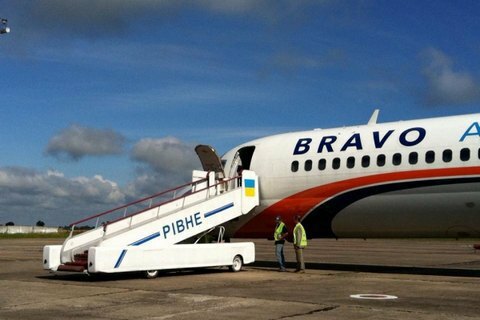 Bravo Airways will fly from Rivne to Antalya on a weekly basis. The first plane in 10 years took off from Rivne airport on 10 July on the regular international flight to Antalya, Turkey. The send-off for Bravo Airways' McDonnell Douglas was attended by the head of the regional state administration, Oleksiy Mulyarenko, according to Radiotrek. The customer for the flight is the TPG travel company. The flight will be made once a week, on Sundays. If the flight proves popular, TPG will consider adding destinations in Poland and Egypt. Rivne airport was built in 1944. It has had the international status since 1992. The airport is 8 km to the southwest of the city of Rivne and is on the Kyiv-Warsaw motorway. The Zdolbuniv railway station is close. Reconstruction is under way at Mariupol airport, which is expected to become the main air hub for Donetsk Region.